Mukono Municipality MP Betty-Nambooze addressing a rally in Masaka besides is Masaka municipality Incumbent MP Mathias Mpuuga. Courtesy Photo. The police leadership could still be evaluating their deployment tactics after legislators Betty Nambooze and Medard Lubega Segona beat numerous road-blocks to travel to Masaka on Sunday. Nambooze, the Member of Parliament for Mukono Municipality and Segona, her Busiro East counterpart, were part of an aborted Democratic Party (DP) meeting called to protest against the leadership of party president Norbert Mao. 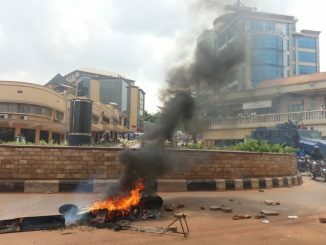 It was after the meeting was blocked by the police that violence broke out in Masaka town. On Sunday, police deployed heavily along Masaka – Kampala highway to prevent Nambooze, who was recently suspended as Buganda Region Democratic Party Vice President, and her supporters from travelling to Masaka for anti-Mao crusade. A section of DP supporters led by Masaka Municipality MP Mathias Mpuuga had convened the crusade at Tropic Inn to discuss the party wrangles which saw Nambooze suspended. However, anti-riot police commanded by John Mwawule, the Masaka District Police commander, raided the hotel and ordered all guests to leave the place. 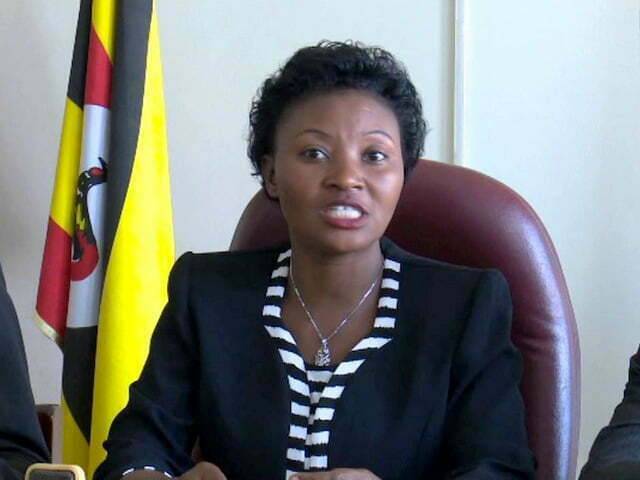 Police mounted road blocks along Kampala – Masaka Highway to block MP Nambooze from making it to Masaka. But Namboze, travelling with Segona, managed to beat heavy security along the 124km road to make it to Masake for the crusade. Nambooze and Segona travelled in a black Cross Country Mercedes Benz. Despite the fact that police had erected three road blocks in Lwera alone, Nambooze and Segona went through without their vehicle being checked. Police near Kayabwe and at the road block near Lukaya Rice Farm waved the vehicle to proceed but stopped coasters carrying passengers to Masaka. It was only at Lukaya that the two MPs waved to supporters that police noticed them and attempted to arrest them but they still eluded Police and drove off. At Kaddugala trading centre, Nambooze branched off towards Kalungu district, connected to Villa Road and emerged from Kyabakuza. The drivers of two police patrol vehicles got confused and continued to Masaka through Villa – Maria road yet Nambooze had continued to Bukomasimbi. At this point, Nambooze and Segona changed the vehicle entered one blue car and connected to Kyabakuza – Sembabule road. At around 2pm, the two opposition legislators had made it to Masaka. Police was surprised to see her at Mathias Mpuuga’s office. Police moved and fire rubber bullets at Segona and arrested him. 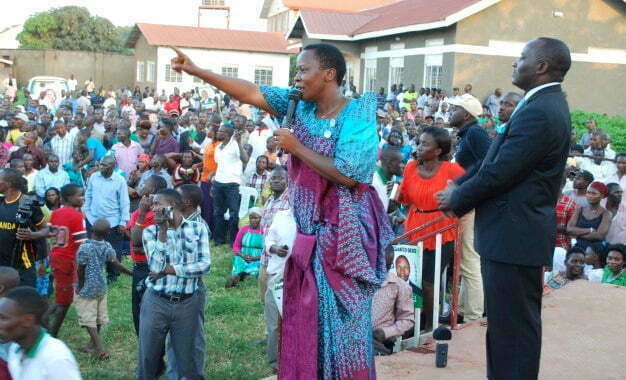 Next was Nambooze who, too, was arrested as police fired teargas to disperse a crowd that had formed. In the chaos that ensued, police ran out of teargas forcing military police to intervene. As the military police from Masaka Amoured Brigade beat up people, some of the DP supporters attacked police personnel who had run out of teargas. Juliet Nakawala, the head of Criminal Investigations and Intelligence (CIID) at Masaka Central Police station, was the first officer to be beaten. An unidentified man kicked her and she fell in the sewage lagoon near Byansi Medical Centre along Elgin Street. The DP supporters accused her of leading the arrest of Nambooze. A police officer identified as James Yocar who was running away from the mob fell and twisted his leg. He is nursing injuries at Masaka Regional Referral Hospital. 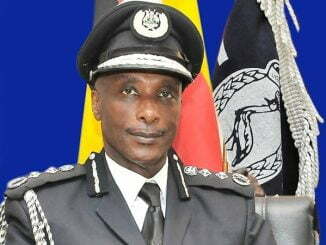 Latif Zaake, the Southern Region Police Commander says Nambooze and her group camouflaged and used different vehicles which confused the police. He also says they used village routes. Zaake however says police used excessive force after DP supporters turned violent and started throwing stones at police officers.